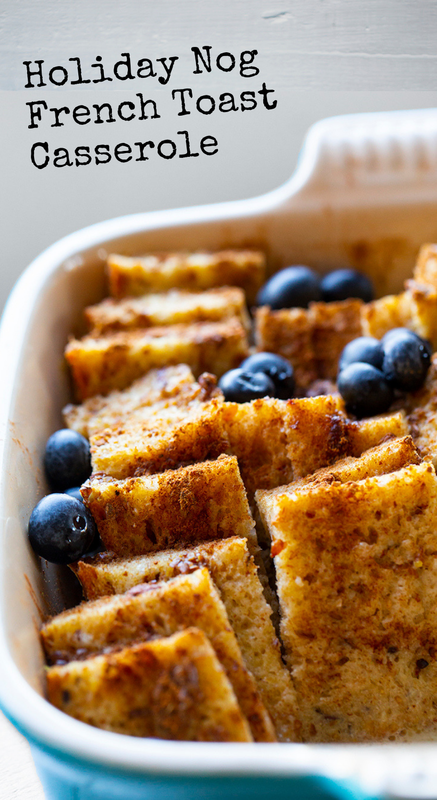 This Holiday Nog French Toast Casserole is perfect for a cozy December morning. 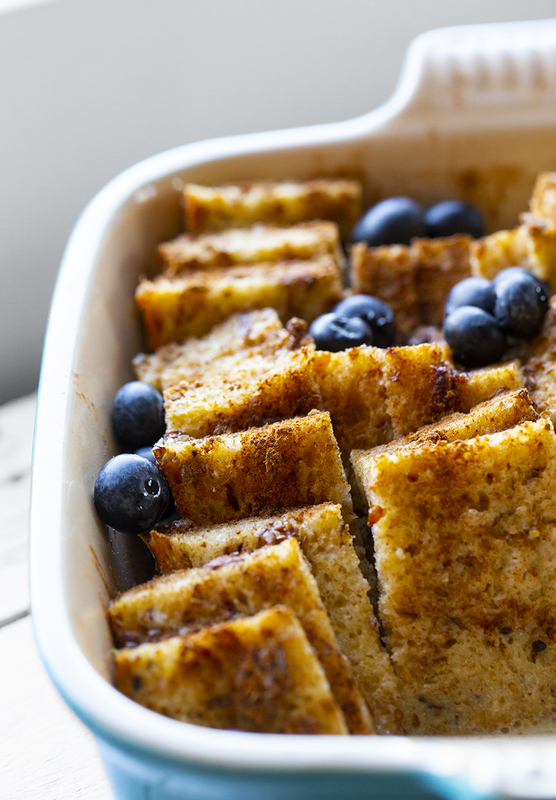 I love this dish because the bread bakes up fluffy and soft, fully marinated in yummy nog flavor. Cinnamon. Vanilla. Holiday cozies. 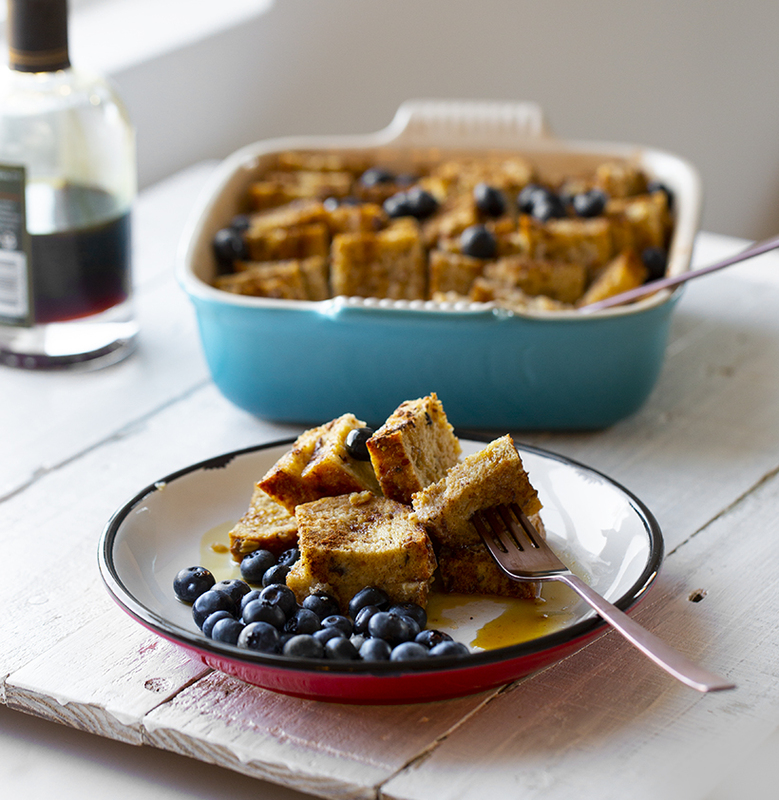 Plus, this dish feeds a crowd while taking minimal effort on your part. Cinnamon, vanilla and holiday flavor baked in. 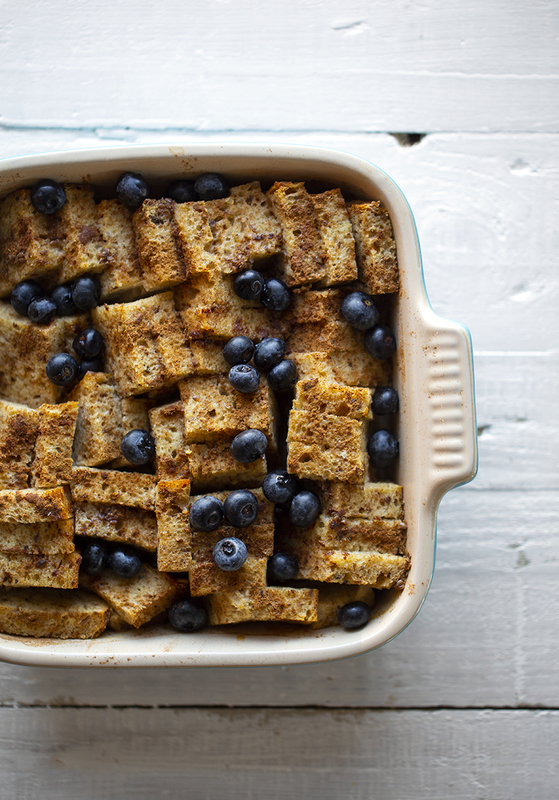 Minimal ingredients in this baked delight. 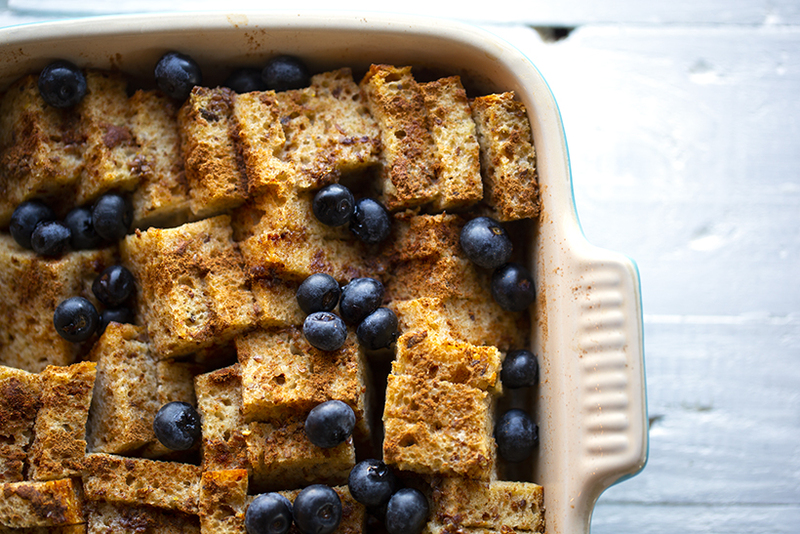 Mornings right now mean we whip up yummy things and sit and chill for a few minutes. The kittens are fed, windows open for a fresh breeze, and sparkly sunbeams coming in. Breakfast is probably my favorite meal of the day on a weekend and I'm guessing I'm not the only one. Casserole foods. I admit that I do not make nearly enough 'casserole' style recipes. But the few that I have made I always adore. My baked mac 'n cheese that I made recently was another casserole-dish winner. If you are into casserole-dish recipes, here are a few faves..
What are some of your fave casserole-style dishes? I'd love to know! 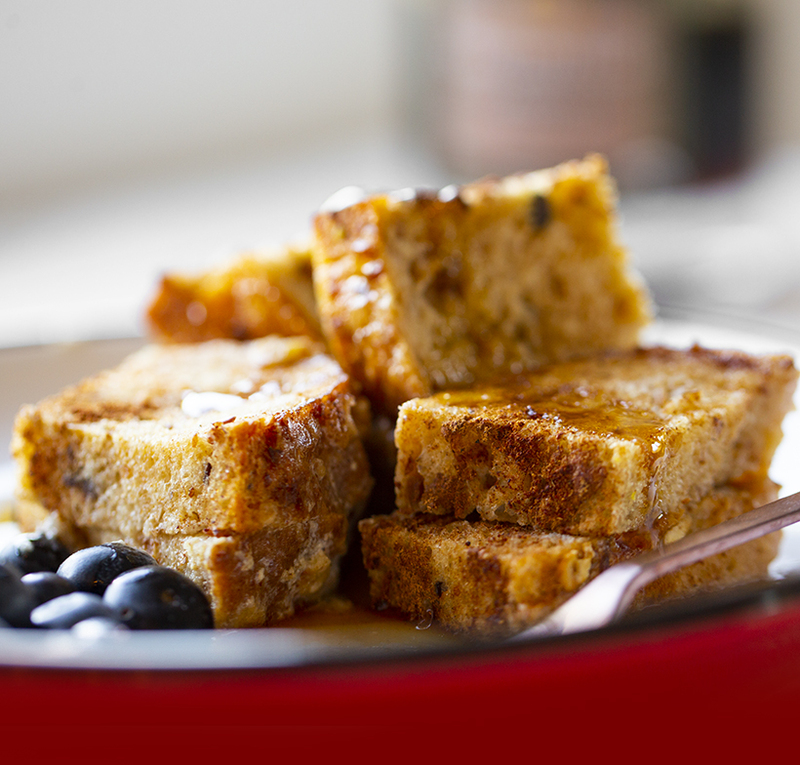 Toppings: You could dot the baked french toast with fresh berries, banana, nut butter, nuts, maple syrup and even whipped coconut cream if you are going for decadent. 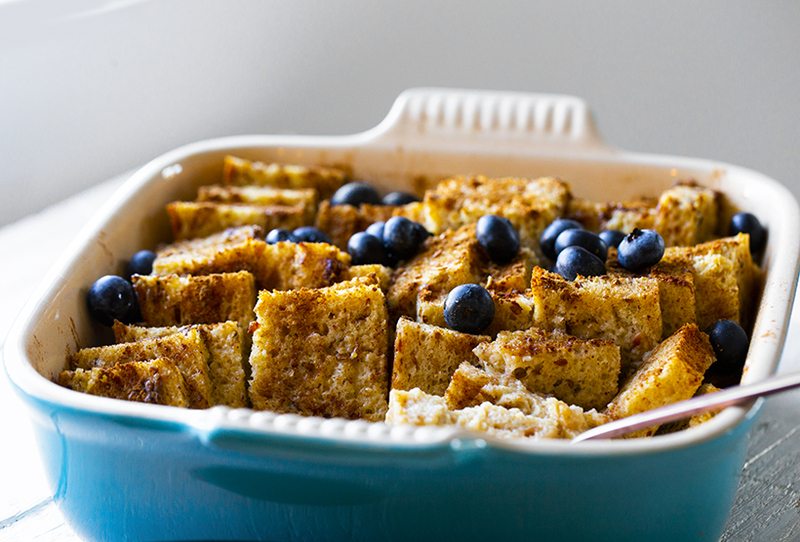 I loved adding the blueberries. Strawberries would be nice too. Of course, since this is winter, sliced apples, pears or even pomegranate seeds may be more appropriate. The point of the toppings is to add a bit of color while adding nutrition and also some texture too. Vegan Nog? There are a few brands out there, but the one I find most often is Silk's Nog. It works well. If you have a choice, go for the richest and creamiest nog you can find. 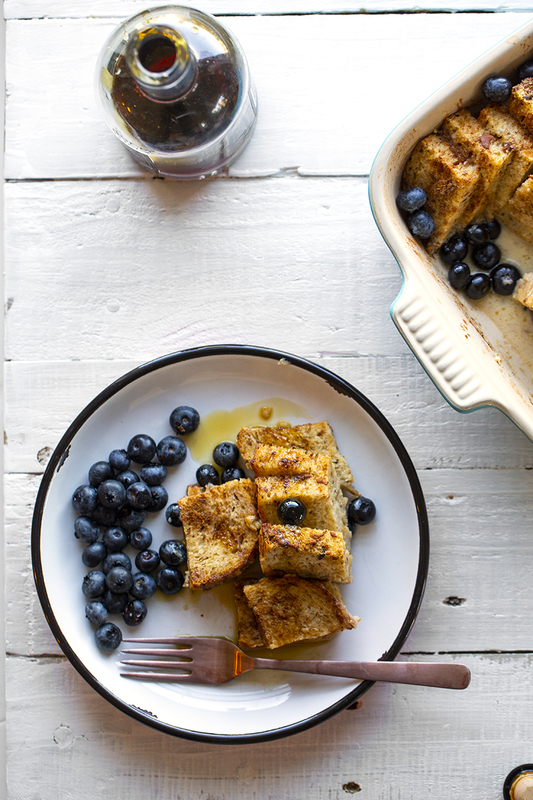 Stuffed french toast? 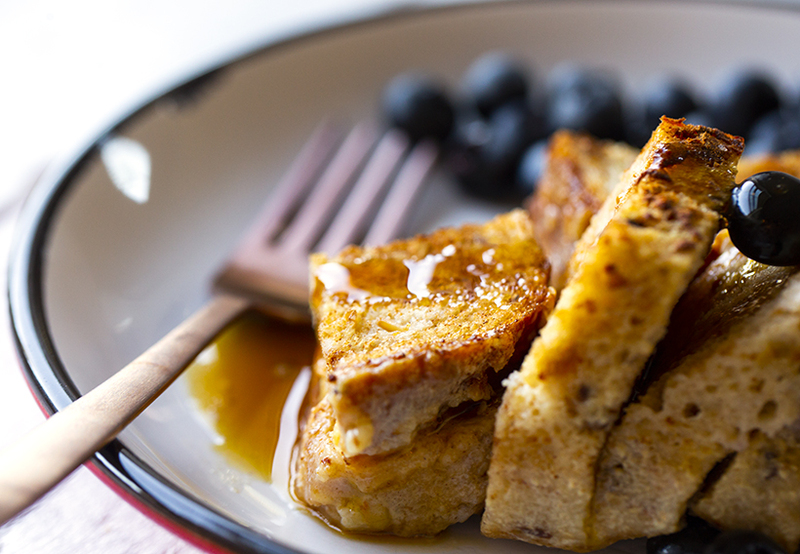 If you want to get fancy with your french toast, you could "stuff" the layers of bread with almond butter. Another option is sliced bananas or even cream cheese. 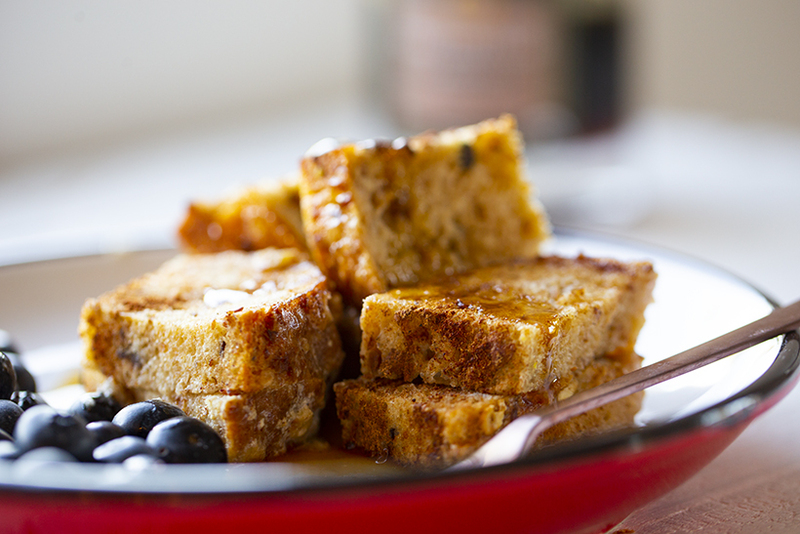 I haven't tried any 'stuffed' flavors with this nog version of french toast yet, but I am guessing almond butter would be super yummy and not take away from the rich nog flavors. Pumpkin butter could also be an interesting 'stuffing' ingredient for the holidays. What type of bread? I tested this recipe twice. The first time I used a multi-grain sandwich bread. The second time I used a sourdough. I liked both versions. Seriously, any type of bread works well. If you bread is a bit on the stale or dry side, your ending texture will be a bit better - a bit less soggy. But I used fresh bread for one of the trials and it worked fine. 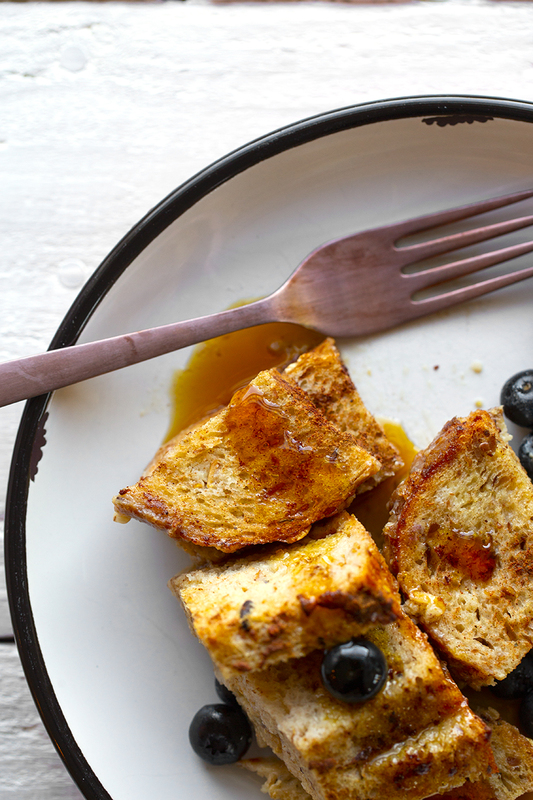 How much liquid you add will also determine how soft your french toast gets. I basically saturated my bread, but made sure there was only a small amount of liquid in the bottom of the pan when I put it in the oven. Play around with it and find what technique works for you. Holiday Shopping: DONE. Looking for an awesome plant-based + no-wrapping paper required gift for friends and family? Give them a gift that will keep on giving. The Finding Vegan Meals Program. This program is packed with fun and inspiring tools, tips and resources for starting or reinvigorating a plant-packed diet. ..To purchase the program as a gift, simply click the little present icon and put your giftee's email address into the order form when placing your order. If you have any questions, let me know. Get all the details about the program at FVmeals.com. 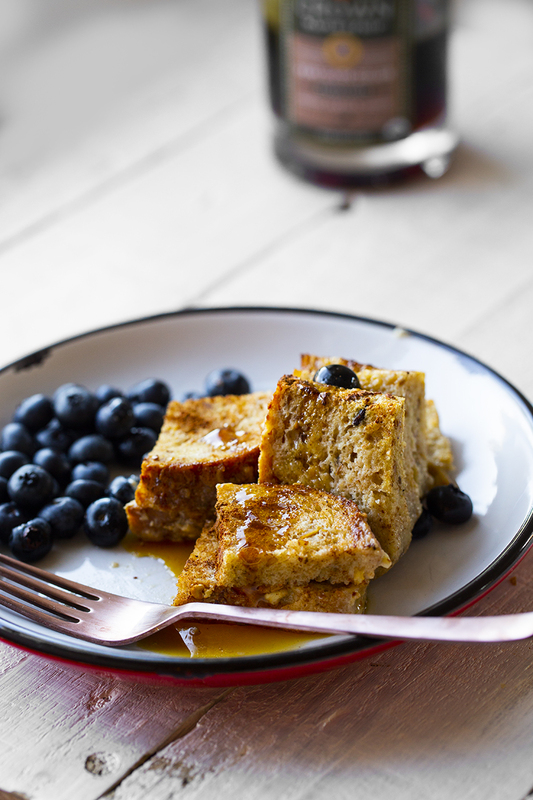 This fluffy vegan french toast is easy to make and bake. Holiday morning approved. Add the nog, vanilla, flax seeds, cinnamon and salt to a bowl. Stir briskly. Set aside for five minutes, while you prep the bread. Slice the bread into finger-sized strips, then halve then to get small rectangles. Line the bread up in a row - using a 8-9 inch baking dish. Pour the nog mixture over top the bread. Tilt and shake the dish a bit to distribute the liquid. If desired, pour additional nog over top if more moisture is needed. Cover with foil and bake at 350 degrees for about 35 minutes. Remove the foil for the last ten minutes of baking. Prep Time: 00 hrs. 12 mins. Want help with vegan meals? Snag my program: Finding Vegan Meals! Details at FVmeals.com.